I was creating a Word document template for my team to use, and I wanted to include a reference number in the header to make it appear on each page. I initially created a field for the user to click and enter the value. The problem with using a simple entry field and sticking it in the header is that it’s grayed-out and easily forgotten. That’s all there is to it. 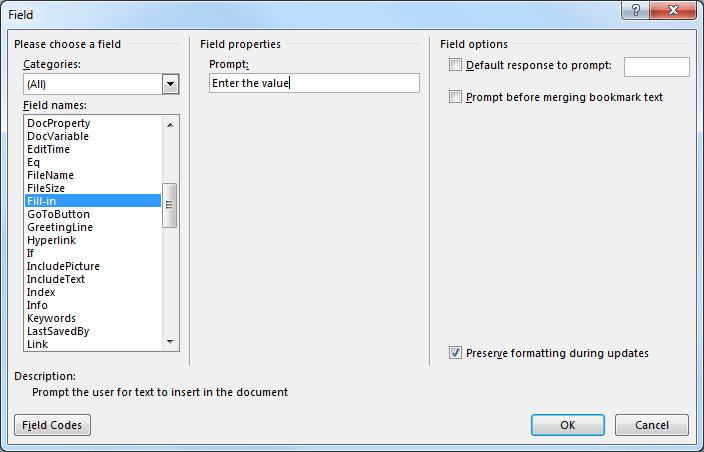 When you create a new document from the template, you’ll be prompted, and the value will be filled in. I have done this but how is it highlighted in the document, it just looks like any other text. What alerts them to update the text or fill it in. 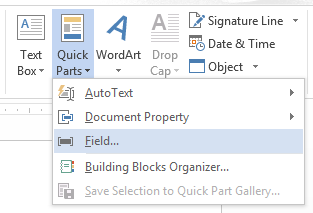 If you save it as a Word template (.dot or .dotx) and then open a New document using that template, it will prompt you when you open the New document. I’ve done this, but what if I want the same info to appear elsewhere? How do I call on the same answer without having another fill-in asking the same question? I have an application that handles the word merge programmatically, including fill-in fields. The problem is with getting the prompt text for the fill-in fields. Any idea how to do that? The problem is that the prompt text can contain any character, including spaces, but when you get the field code text, it includes other stuff at the end – how do you get rid of that other stuff? For example, I have a merge field with prompt text “test merge field”, but when I look at the FieldCode.text, it looks like this “FILLIN test merge field \* MERGEFORMAT”. Is the /* a delimiter?